Whether you’re just starting out in your occupation or a seasoned veteran of the tourism industry, certification from Emerit is available for dozens of frontline, supervisory, and management occupations. Demonstrate your skills and knowledge and be recognized for your dedication to your career, employer, and industry. Once you're certified through Emerit, you earn a prestigious, national credential that identifies you as a true professional in your field. 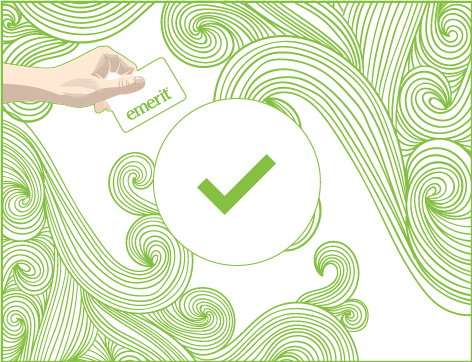 Use Emerit professional designation on your business cards and resume demonstrates to inform employers that you have the skills, knowledge, and dedication they're looking for. Familiarize yourself with the National Occupational Standards for your occupation. Exams and evaluations are based on these standards. Review your Certification Prep Pack. This document is included with your registration and provides information about the process and sample exam questions. For those who need it, online training is available for most occupations. Training is designed to improve the skills and knowledge included in the National Occupational Standards. An online Exam Prep Tutorial is also available to help you prepare for your certification exam. Pass a supervised multiple choice exam based on the National Occupational Standards for your occupation. Provide a record of relevant experience related to your occupation. Your work history is a good place to start. If you don’t have relevant work experience, volunteer hours, formal training, and education may also count. For some occupations (usually management level), pass a practical performance evaluation. Depending on the occupation, this may consist of a structured interview, a series of case studies to complete, or submission of a professional portfolio demonstrating your skills and knowledge. Find your occupation and get started today.